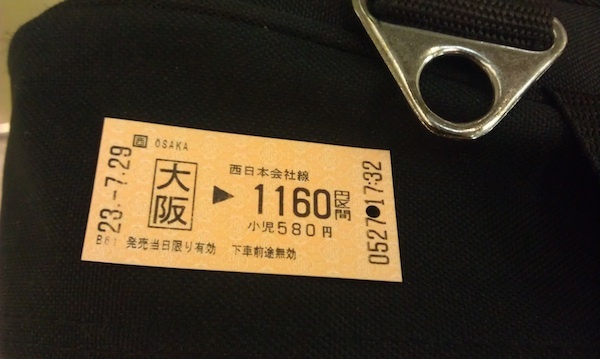 JR ticket from Osaka Umeda to Kansai Airport. The exit gate machines swallow your ticket so I took pictures of each one as I went in order to claim them on expenses. This year I’ve been travelling a lot for work. It’s been deliberate — I decided that being mid-contract, 2011 was my best year to do all the conferences, talks, workshops, and courses (as both teacher and student) as I possibly could. Getting into the groove of semi-constant travelling, and getting into a routine that meant I wasn’t constantly forgetting my passport or being too jetlagged to remember my name, has been a learning experience. So I thought I’d blog about what has worked for me. I seem to have a lot to say on this topic so this’ll be a series, the first of which is Preparing For The Trip. There’s a lot of generic travel advice in this first bit, but I hope that’s useful too. One of the delights of being an academic is the multitude of transferable skills one has to have (*insert wry grin*), including those of travel agent and event planner. This got a lot easier for me once I came up with the Amazing Conference Spreadsheet (ACS). This is a GoogleDoc spreadsheet with two parts. The first is a PLANNER where every event, including potential and unconfirmed events, has a column in which I list the details of, and check off, various steps such as “enter business trip request form”, “book hotel”, “submit conference registration form”, “check out location on Streetview”, etc. I can look at this and at a glance see the things that are outstanding for a given trip. I also use it for keeping track of advances, and expenses on the go. The second is a PACKING CHECKLIST tailored to business travel and includes things like “video cable connector for Mac”, “map of venue”, and “business cards”, but also includes each item I individually take, rather than a generic catchall like “Toiletries” or “Shoes”. If you, like me, are the kind of person who remembers the toothbrush but not the toothpaste, then this level of detail could work for you too. People often think I am organised. I’m not. I just have good coping strategies. I’m more than happy to share a copy of these if anyone wants one, just let me know. Continuing my trend of providing free advertising to people who make science cool and accessible: Made With Molecules. ThinkGeek already did the t-shirt thing with their caffeine molecules, but the jewellery is very lovely, especially the earrings and simple necklaces (I loathe charm bracelets). Putting on my once-was-jewellery-designer hat, I'm all for putting a premium on design work and charging people accordingly, but I think the prices are just out of reach for those (grad students/postdocs) who might want this sort of thing the most. I mean, I know precious metal prices have risen ridiculously in the last 2 years, but I wouldn't stretch to $85 for a simple silver necklace. I know, what a killjoy, right? At Edge.org: Jaron Lanier on the aggregating-phenomena of the the web, where he views Wikipedia (for example) as one of many "online fetish site(s) for foolish collectivism". Yeah, exactly. The Jolie-Pitt enterprise and celebrity colonialism. Remind me again what Geri Halliwell does for the UN? Moleskine's City Notebooks (via Londonist). I covet, nngh. Londonist's flickr group is also a great source of internerdly distraction. Where you get your first post-PhD job really matters. Language Log's old but clever posts that have a jolly good time ripping apart that Da Vinci Code book. The decline of the art of the lecture. Slate's slideshow on mad scientists at the cinema. Grr, gnash, wail. A pet peeve. Thoughtful post about men's attempts to defuse feminist anger through joking. In other news, today I voluntarily wore socks and sandals . I don't know how the style part of my brain has been coerced into thinking this is acceptable. It's not fashionable, but certainly comfortable. Maybe all those deputy principals were on to something. I'll be a bit horrified if I start with the wearing of walk shorts, though. Grrlscientist links to Yellow Ibis, which have the coolest science t-shirts. The Darwin phylogeny sketch ones are my favourite, but I’m also fond of “this is what a scientist looks like”. Inside HigherEd offer columns and articles, including Academic AWOL by Mary McKinney, which I found to be a good kick-in-the-pants about Just Getting On With It. A marvellous explication of the cognitive barriers to taking on-board evolutionary thinking, from Chris at Mixing Memory.